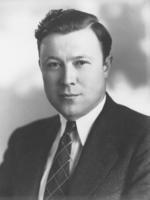 Labor leader Walter Reuther was killed in a plane crash on May 9, 1970. He was 62. Reuther was born in Wheeling in 1907. His father, Valentine, was president of the Wheeling brewers union and led the city’s Socialist Party. As a teenager, Walter began working as an apprentice tool-and-die maker at Wheeling Steel. He soon moved to Detroit and became one of the highest-paid skilled workers for Ford Motors. Frustrated by his union activities, though, the company fired him. He and his brother, Victor, then bicycled through Europe and worked at a Ford-built plant in the Soviet Union. Reuther returned to Detroit when industrial unionism was becoming a major force and became president of a powerful United Auto Workers local. Reuther’s national reputation grew rapidly. By 1937, he represented 30,000 workers. He helped develop strategies, including the sit-down strike, that won major union contracts. In less than a decade, he became national UAW president and achieved cost-of-living increases, productivity pay raises, and unemployment benefits for his workers. Walter Reuther was arguably the most influential labor leader in post-World War II America.